The Systems Engineering Initiative for Patient Safety (SEIPS), housed within CQPI, is a multidisciplinary initiative applying systems engineering, human factors engineering, and quality engineering approaches. This research empirically examines systems design, quality management, job design, and technology implementations that affect safety-related patient and organizational and/or staff outcomes (Carayon et al., 2006; Karsh, et al, 2006). SEIPS was one of 18 patient safety developmental centers originally funded by the Agency for Healthcare Research and Quality (AHRQ), the only such center located in a college of engineering. SEIPS draws on its own members’ expertise, scientific literature, and research findings to develop educational programs on patient safety issues. The educational programs are aimed internally for use in developing a coherent research team and externally for medical consumers, medical providers, and the research community. Ties to local medical delivery systems have been formalized. A core planning team, research affiliates, community affiliates, and student affiliates are part of the SEIPS structure. Oversight and direction is provided to SEIPS by the core planning team comprised of representatives from the UW School of Medicine and Population Health (SMPH) – Maureen Smith, MD, PhD, MPH who functions as the liaison between SEIPS and ICTR-CAP (see below for the description), Tosha Wetterneck, MD, MS, Caprice Greenberg, MD, MPH, Amye Tevaarwerk, MD, Sharon Weber, MD, and Carla Pugh, MD, PhD; School of Nursing – Linsey Steege, PhD, Roger L. Brown, PhD, and Barbara King, PhD, RN; School of Pharmacy – Michelle Chui, PharmD, PhD; College of Engineering – Pascale Carayon, PhD, Douglas Wiegmann, PhD, Carla Alvarado, PhD, CIC, Mary Sesto, PhD, John Lee, PhD, Jingshan Li, PhD, and Vicki Bier, PhD, who, as chair of the department, functions as the liaison between SEIPS and Industrial and Systems Engineering faculty. MyChart Bedside: Evaluate user experiences with MyChart Bedside, a new patient portal designed to improve quality and safety of care. Durojaiye, A.B., McGeorge, N.M., Puett, L.L., Stewart, D., Fackler, J.C., Hoonakker, P.L.T., Lehmann, H.P., Gurses, A.P. (2018). Mapping the flow of pediatric trauma patients using process mining on trauma registry data. Applied Clinical Informatics, 9 (3); pp. 654-666. https://doi.org/10.1055/s-0038-1668089. Hundt, A.S., Carayon, P., Stamm, J., Agrawal, V., Hoonakker, P.L.T. (Accepted). Roles and responsibilities in the VTE prophylaxis process. Paper accepted for presentation at the IEA 2018, conference, Florence, Italy, August 26-30, 2018. Joliff, A., Casper, G., Ponto, K., Hoonakker, P.L.T., Tredinnick, R., Martell, T., (Accepted). The perceived usefulness of household features for personal health information management. Paper accepted for presentation at the IEA 2018, conference, Florence, Italy, August 26-30, 2018. Salwei, M., Carayon, P., Hundt, A.S., Kleinschmidt, P., Hoonakker, P.L.T., Patterson, B.W., Wiegmann, D. (Accepted). Team adaptation to complex clinical situations: VTE prophylaxis in hospitalized patients. Paper accepted for presentation at the IEA 2018 conference, Florence, Italy, August 26-30, 2018. Wang, Y., Patterson, B., Ravi, S., Wiegmann, D., Hundt, A.S., Hoonakker, P.L.T., Kleinschmidt, P., Salwei, M., Wirkus, E., Carayon, P. (2018). EHR Flowchart of Information Search for Cues of PE Diagnosis in the ED. Poster presented at the 26th Annual Wisconsin Emergency Medicine Research Forum, March 15, 2018, Madison, WI. Wooldridge, A., Carayon, P., Eagan, B. and Shaffer, D.W. “Quantifying the qualitative with Epistemic Network Analysis: A human factors case study of task-allocation communication in a primary care team”, 2018, IIE Transactions on Healthcare Systems Engineering, 8(1): 72-82. Wooldridge, A. R., Carayon, P., Hoonakker, P.L.T., Hose, B.-Z., Gurses, A. (Accepted for presentation). Redefining the Scope of the Care Transition Process: A Study of Pediatric Trauma Care Transitions. Paper accepted for presentation at the HFES conference, Philadelphia, PA, Oct 1-5, 2018. Hoonakker, P.L.T., Hundt, A.S., Asan, O., Valdez, R., Yang, Y. & Rivera, A.J. (2017). Designing Health Information Technology from a Human Factors Perspective. Proceedings of the ODAM conference, Banff, Canada, July 31-Aug 3, 2017, pp. 532-537. Hose, B-Z., Carayon, P., Hoonakker, P., Wooldridge, A.R., Ross, J., Kohler, J., Brazelton, T., Eithun, B., Kelly, M., Dean, S., Rusy, D., Gurses, A. (2017). Information Needs of Physicians in Pediatric Trauma. Poster presented at the Human Factors and Ergonomics in Healthcare, March 5-8, New Orleans, Louisiana. Kelly, M.M., Hoonakker, P.L.T., (2017). Parent experiences using a tablet computer to access their child’s hospital medical record. Paper presented at the PAS 2017 conference, May 7, 2017, San Francisco, CA. Thurber, A., Hoonakker, P.L.T., Ehlenfeldt, B.D., Dean, S.M., Rankin, R.J., Byrne, B.J., Heatley, D.G., Bunton, J.A., Kelly, M.M., (2017). Implementation of a patient portal on a tablet computer across a children’s hospital. Poster presented at the 10th Annual Conference on the Science of Dissemination and Implementation in Health, Washington, DC, December 4-6, 2017. Wooldridge, A. R., Carayon, P., Hoonakker, P., Hose, B.-Z., Ross, J., Kohler, J., Brazelton, T., Eithun, B., Kelly, M., Dean, S., Rusy, D., Gurses, A. (2017). Understanding Team Complexity in Pediatric Trauma Care. Human Factors and Ergonomics in Healthcare, March 5-8, New Orleans, Louisiana. Wooldridge, A., Gurses, A., Carman, E.M., Waterson, P. Sesto, M., Hoonakker, P.L.T. (2017). Designing and managing healthcare transitions. Proceedings of the ODAM conference, Banff, Canada, July 31-Aug 3, 2017, pp. 538-542. Hoonakker, P.L.T., Du, S., Hundt, A.S., Stamm, J., Patterson, B., Carayon, P., (2016). Perceived Effectiveness of Clinical Decision Support to Improve VTE Prophylaxis: A Comparison of Physicians, Pharmacists and Nurses. Poster presented at the AMIA conference, Chicago, IL, Nov 12-16, 2016. Poster was nominated for the AMIA Distinguished Poster Awards. Kelly, M., Hoonakker, P.L.T., Dean, S.M. (2016). The Impact of a Portal for Parents of Hospitalized Children on Healthcare Team Workflow. Poster presented at the AMIA conference, Chicago, IL, Nov 12-16, 2016. McGeorge, Nicolette M., Durojaiye, Ashimiyu B., Fackler, James C., Xie, Anping, Rosen, Michael A., Hunt, Elizabeth A., Stewart, Dylan, Puett, Lisa L., Wooldridge, Abigail R., Carayon, Pascale, Hoonakker, Peter, Gurses, Ayse P. (2016). Pediatric Trauma Care Transitions: Understanding Teamwork for Health IT Design. Seventh Annual Johns Hopkins Medicine Patient Safety Summit: Working Together to Achieve Zero Preventable Harm, October, 2016, Baltimore, MD. Patterson, B., Otles, E., Hundt, A.S., Hoonakker, P.L.T., & Carayon, P. (2016). Cues for VTE Diagnosis in the Emergency Department: A Sociotechnical Systems Approach for Clinical Decision Support. Poster presented at the AMIA conference, Chicago, IL, Nov 12-16, 2016. Poster was nominated for the AMIA Distinguished Poster Awards. Wooldridge, A.R., Carayon, P., Hoonakker, P.L.T., Musa, A., Bain, P. (2016). Technology-mediated communication between patients and primary care clinicians and staff: Ambiguity in secure messaging. Paper presented at the HFES conference 2016, Washington DC, Sep 19-23, 2016. Zhong, X. Li, J., & Bain, P., Musa, A., Hoonakker, P.L.T. (2016). Improving Accessibility in Primary Care through E-visits. Paper presented at the 2016 IIE Annual Conference, May 21-24, 2016, Anaheim, CA. Pecenac, K., Hoonakker, P., Brown, R., & Carayon, P. (2014). Virtual intensive care unit nurses’ trust and satisfaction of monitored bedside intensive care unit nurses. Paper presented at the Academy Health Conference, San Diego, CA. Kianfar, S., Li, Y., Carayon, P., Hundt, A.S., & Hoonakker, P. (2014). Understanding care coordination for chronically ill patients? Paper presented at the Human Factors and Ergonomics (HFES) Society’s 58th Annual Meeting, Chicago, IL. Hundt, A.S., Carayon, P., Alyousef, B., Cartmill, R.S., Hoonakker, P., Kianfar, S., Tomcavage, J., Salek, D., Petrucci, J., & Walker, J. (2014). 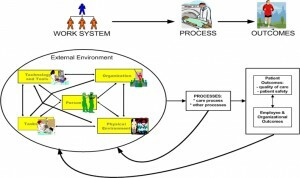 Community ergonomics applied to the implementation of a region-wise care coordination program. Proceedings of the 11th International Symposium on Human Factors in Organizational Design and Management (ODAM) Copenhagen, Denmark. pp. 475-480. Xie, A., Kelly, M.M., Cox, E.D., Cartmill, R.S., Li, Y., & Carayon, P. (2014). A participatory ergonomics approach to family-centered rounds process redesign. Paper presented at the 2014 Symposium on Human Factors and Ergonomics in Health Care: Leading the Way, Chicago, IL. Carayon, P. (2013). Reengineering Health Care Through a Human Factors Systems Approach. Paper presented at the 2013 Symposium on Human Factors and Ergonomics in Health Care, Baltimore, MD. Carayon, P., Kianfar, S., Hundt, A.S., Tomcavage, J., Salek, D., Petrucci, J., Hoonakker, P., Alyousef, B., Walker, J. (2013). Health IT-related obstacles and facilitators in coordinating care for patients with chronic illness: A longitudinal study. Paper presented at the 11th International Conference on Naturalistic Decision Making, Marseille, France. Alyousef, B., Carayon, P., Hoonakker, P., Hundt, A.S., Cartmill, R.S., Tomcavage, J., Hassol, A., Chaundy, K., Younkin, J., & Walker, J. (2012). Care managers’ challenges in using multiple health IT applications. Proceedings of the Human Factors and Ergonomics Society (HFES) 56th Annual Meeting, Boston, MA. pp. 1748-1752. Xie, A., Carayon, P., Kelly, M.M., Li, Y., Cartmill, R.S., DuBenske, L. L., Brown, R.L., & Cox, E. D. (2012). Managing different perspectives in the redesign of family-centered rounds in a pediatric hospital. Proceedings of the Human Factors and Ergonomics Society (HFES) Annual Meeting, 56 (1), 1733-1737. Bisantz, A.M., Carayon, P., Miller, A., Khunlertkit, A., & Arbaje, A. (2012). Using human factors and systems engineering to improve care coordination. Paper presented at the Human Factors and Ergonomics Society (HFES) 56th Annual Meeting, Boston, MA. Wetterneck, T.B. & Holman, G.T. (2011). Use of tandem observations in ambulatory primary care to evaluate physician.Paper presented at the 3rd International Conference Healthcare Systems Ergonomics and Patient Safety Conference,Oviedo, Spain. Lapin, J., Krueger, D., Wetterneck, T.B., Holman, G.T., Beasley, J., & Karsh, B.-T. (2011). The myth of primary care workflow. Paper presented at the Primary Care Work-life to Wellness: Engineering Quality, Safety, and Satisfaction,Wisconsin Dells, WI. Hoonakker, P., Wetterneck, T., Carayon, P., Cartmill, R.S., & Walker, J. (2011). Drug alerts override from a human factors perspective. Proceedings of the Healthcare Ergonomics Systems and Patient Safety (HEPS) Conference, Oviedo, Spain. pp. 367-371. Hoonakker, P., McGuire, K., & Carayon, P. (2011). Sociotechnical Issues of Tele-ICU Technology. In D.M. Haftor & A. Mirijamdotter (Eds.). Information and Communication Technologies, Society and Human Beings: Theory and Framework, (pp. 225-240). IGI Global: Hershey, PA.
Hoonakker, P., Carayon, P., Khunlertkit, A., McGuire, K., & Wiegmann, D. (2011). Case study research: An example from the tele-ICU. Paper presented at the ODAM Conference 2011, Grahamstown, South Africa. Carayon, P., Cartmill, R.S., Blosky, M.A., Brown, R., Hackenberg, M., Hoonakker, P., Hundt, A.S., Norfolk, E., Wetterneck, T.B. & Walker, J. (2011). EHR acceptance by ICU physicians and nurses. Proceedings of the Healthcare Ergonomics Systems and Patient Safety (HEPS) Conference, Oviedo, Spain. Hoonakker, P., Khunlertkit, A., McGuire, K., Wiegmann, D., & Carayon, P. (2011). A day in life of tele-Intensive Care Unit nurse. Proceedings of the Healthcare Ergonomics Systems and Patient Safety (HEPS), Oviedo, Spain. McGuire, K., Carayon, P., Hoonakker, P., Khunlertkit, A., & Wiegmann, D. (2010). Communication in the tele-ICU. Paper presented at the Systems Engineering Initiative for Patient Safety (SEIPS) Short Course, Madison, WI. Lapin, J., Beasley, J., Smith, P., Hagenauer, M.E., & Karsh, B.-T. (2010). Hazards in the primary care of elderly patients: A qualitative analysis of physician hazard reports. Paper presented at the Family Medicine 40th Anniversary Celebration, Madison, WI. Wetterneck, T.B., Cartmill, R.S., Walker, J.M., Carayon, P. (2010). Duplicate medication orders after CPOE implementation. Journal of Hospital Medicine, 5 (3), 81. Hoonakker, P., Cartmill, R.S., Carayon, P., & Walker, J. (2010). Development of the survey to evaluate CPOE/EHR implementation in ICUs. Technical Report, Center for Quality and Productivity Improvement (CQPI), Madison, WI. Wetterneck, T.B. & Holman, G.T. (2009). Medication information management and error recovery in primary care clinics.Paper presented at the Wisconsin Primary Care Research and Quality Improvement Forum, Madison, WI. Carayon, P., Smith,P., Hundt, A.S., Kuruchittham, V. & Li, Q. (2009). Implementation of an electronic health records system in a small clinic: The viewpoint of clinic staff. Behaviour and Information Technology, 28 (1), 5-20. Carayon, P. (2009). The balance theory and the work system model… Twenty years later. International Journal of Human- Computer Interaction, 25 (5), 313-327. Carayon, P., Wetterneck, T.B., Hundt, A.S., Ozkaynak, M., DeSilvey, J., Ludwig, B., Ram, P., & Rough, S.S. (2007). Evaluation of nurse interaction with Bar Code Medication Administration (BCMA) technology in the work environment. Journal of Patient Safety, 3 (1), 34-42. Schultz, K., Carayon, P., Hundt, A.S., & Springman, S.R. (2007). Care transitions in the outpatient surgery process: Facilitators and obstacles to information flow and their consequences. Cognition, Technology & Work, 9 (4), 219-231. Beard, V.A. & Cartmill, R.S. (2007). Gender, collective action and participatory development in Indonesia. International Development Planning Review, 29 (2), 185-213. Gurses, A.P. & Carayon, P. (2005). Identifying performance obstacles among intensive care nurses. Proceedings of the Human Factors and Ergonomics Society (HFES) 49th Annual Meeting, Santa Monica, CA. pp. 1019-1023. Schultz, K., Carayon, P., & Hundt, A.S. (2005). Patient care process and information flow in outpatient surgery.Proceedings of the Human Factors and Ergonomics Society (HFES) 49th Annual Meeting, Orlando, FL. Wetterneck, T.B., Carayon, P., Sobande, F., & Hundt, A.S. (2005). Technology characteristics predicting end user acceptance of SMArT intravenous infusion pumps. Proceedings of the Human Factors and Ergonomics Society (HFES) 49th Annual Meeting, Orlando, FL. Alvarado, C.J., Carayon, P., & Hundt, A.S., (2004). Patient Safety Climate (PSC) in outpatient surgery centers. Proceedings of the Annual Meeting of the Human Factors and Ergonomics Society 48th Annual Meeting, New Orleans, LA. Wetterneck, T.B., Skibinski, K., Schroeder, M., Roberts, T.L., & Carayon, P. (2004). Challenges with the performance of failure mode and effects analysis in healthcare organizations: An IV Medication Administration HFMEATM. Paper presented at the Annual Conference of the Human Factors and Ergonomics Society, New Orleans, LA. Karsh, B-T., Carayon, P., Smith, M., Skibinski, K., Thomadsen, B., Brennan, P. & Murray, M.E. (2004). The University of Wisconsin-Madison multidisciplinary graduate certificate in patient safety. In K. Henriksen, J.B. Battles, E. Marks, & D.I. Lewin (Eds.). Advances in Patient Safety: From Research to Implementation. Hundt, A.S., Carayon, P., Ayoub, P. & Alvarado, C. (2003). Collecting workers’ perceptions of performance obstacles in outpatient surgery. Proceedings of the Human Factors and Ergonomics Society (HFES) 47th Annual Meeting, Denver, CO.
Hundt, A.S., Carayon, P., Smith, P.D. & Kuruchittham, V. (2002). A macroergonomic case study assessing electronic medical record implementation in a small clinic. Proceedings of the Human Factors and Ergonomics Society (HFES) 46th Annual Meeting, Baltimore, MD. Carayon, P. & Smith, P. (2000). Evaluating the human and organizational aspects of Information Technology implementation in a small clinic. Proceedings of the Systems, Social and Internationalization Design Aspects of Human-Computer Interaction, pp. 903-907. Carayon, P. & Smith, M.J. (2000). Work organization and ergonomics. Applied Ergonomics, 31, 649-662.